The NFL’s recent, controversial kneeling protests by players during the national anthem have somehow transferred over to the women’s NBA (WNBA). The take a knee incidents were deemed controversial because many took it as a sign of disrespect to the American flag and those who fought for it. Others said it’s an inappropriate time and venue to protest. During the first game of the finals on Sunday, Sept. 24, the LA Sparks refused to stay on court during the national anthem and instead walked off to stay in their locker room. 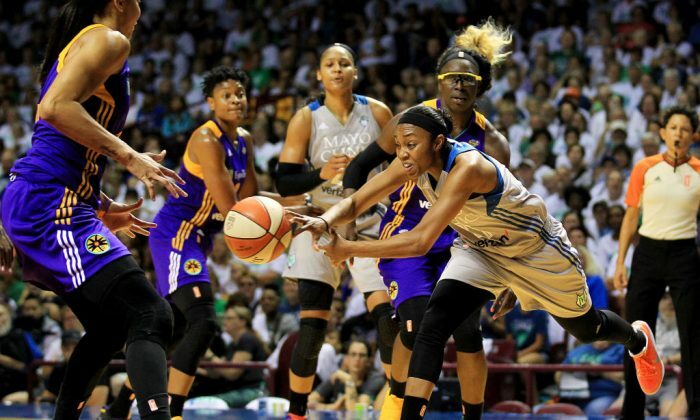 Their opponents, the Minnesota Lynx stayed on court but stood linking arms. Below was the scene on court at the time. The audience’s reaction to the Sparks was clear. They were booed as they walked off the court during the anthem, and were booed again when they came back onto the court. Lindsey Thiry, a sports reporter for the Los Angeles Times posted a video on Twitter showing the crowd’s reaction as the Sparks returned to court. Sparks booed as they leave the floor for the playing of the national anthem here in Minneapolis. Prior to the game, the Sparks released a press statement explaining their decision to stay in the locker room. “After careful and thoughtful discussion, the players of the Los Angeles Sparks unanimously determined that we would remain in the locker room in solidarity with the many players of the NFL who took part in demonstrations today all over the country,” the statement said. WNBA President Lisa Borders told reporters at a pregame press conference that they support their “big brother the NBA,” USA Today reported. “We all have watched television today and our social media feeds and we know this is an interesting time in our country,” Borders said. “Let me just say our commissioner, my colleague, and my friend Adam Silver put out a statement yesterday and I want you all to know that I personally believe all of us stand in full support with Adam, our big brother—the NBA—and our entire enterprise” she added.